Do you make a summer bucket list? I haven’t the last few years, opting instead to “keep my options open” and “see what happens.” It’s been about as productive as the last time I grocery shopped hungry without a list (i.e. a disaster in which I managed to purchase three boxes of cereal and forget the milk). This summer, instead of haphazardly filling my metaphorical cart, I’m making a list of activities that take advantage of this special season. 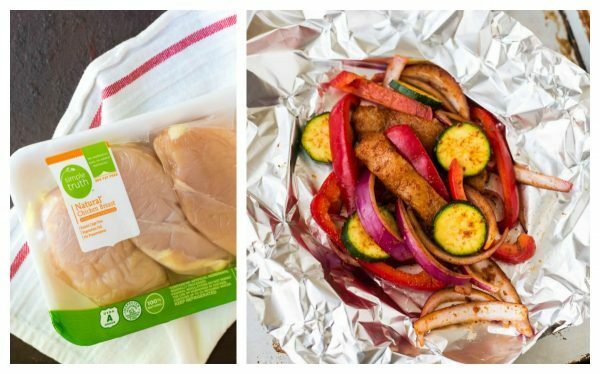 At the top: cooking simple, summery dinners like these Grilled Chicken Fajita Foil Packets on our back porch. While it’s tempting to load my list with big-ticket items—the camping trip Ben and I have been talking about for years but have yet to take, riding a ferry across Lake Michigan—I want to focus on small, everyday activities too. Summers here in Wisconsin are precious and brief. Rather than wait for a one-time weekend camping trip, I’m challenging myself to live the summer high life in one little way each day. One of my biggest regrets from last summer, aside from not making a single s’more (I KNOW), is that we didn’t grill out nearly as much as we could have. This summer, I’m aiming to grill at least twice a week, a goal I feel is completely attainable, particularly now that these Grilled Chicken Fajita Packets are in our lives. I realize grilling twice per week might not impress the grill gurus who cook out almost every night, have been known to grill through snowstorms, and can pull off a steakhouse-worthy filet with their eyes closed. Still, however, it is progress and a new skill too. I am still on the more novice end of the grilling spectrum, which is why you can trust my sincerity when I say this: ANYONE can make these Grilled Chicken Fajitas. They are simple and delicious, and the foil packet acts like a super shield to ensure recipe success. 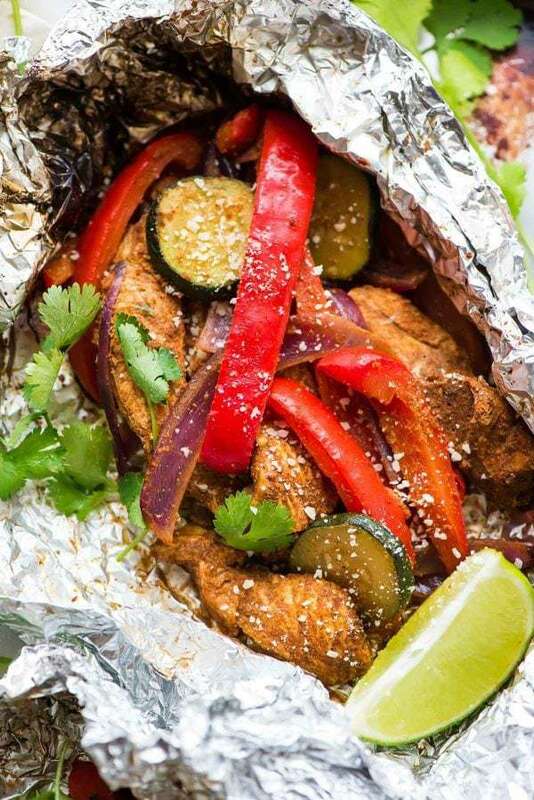 Grilled Chicken Fajitas in Foil Are Easy! 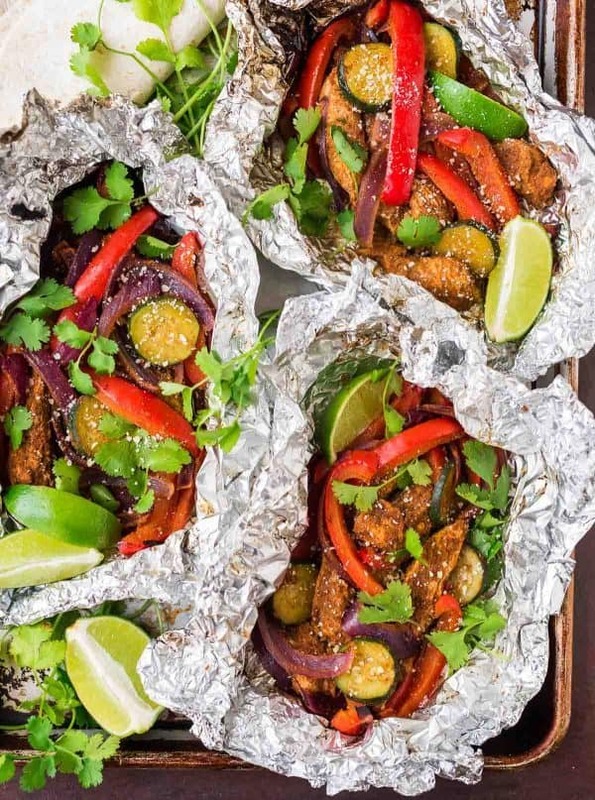 Whether you work the grill like a master chef or you don’t know how to light it, you can make chicken fajitas on the grill in foil. Slice the chicken and your veggies of choice, toss them with the chicken fajita seasoning, then pile them into the foil. Make a packet, toss it on the grates, and DONE. I even have a perfectly spiced, Tex-Mex terrific chicken fajita seasoning blend all measured out for you, so you won’t need a special spice packet or marinade. After a few minutes on the grill, the fajitas will be sizzling hot and ready for stuffing into tortillas. The beauty of grilled food is in its simplicity, which means that the quality of every ingredient matters, especially when it comes to meat. Lately I’ve been loving Simple Truth Chicken, which I purchase at Pick ‘n Save, my local grocery store. It’s free of artificial ingredients, preservatives, and other synthetic materials, and the chickens are fed an all-vegetarian diet that is free of antibiotics and hormones. Plus, it’s super tasty! Like other Simple Truth brand products (which can be found at many Kroger-affiliated grocery stores), Simple Truth is minimally processed and designed to make shopping for quality ingredients easier and more affordable. I’ve loved all of the Simple Truth products I’ve tried so far, and the chicken has become a staple. I’m going to be working on my summer bucket list over the next week or so, and I’m dying to know: what’s on yours? Must-do summer activities? Items you hope to grill yourself? These Grilled Chicken Fajitas are going to be a staple at our table, but I’d love your input for new grilling recipes to try too. 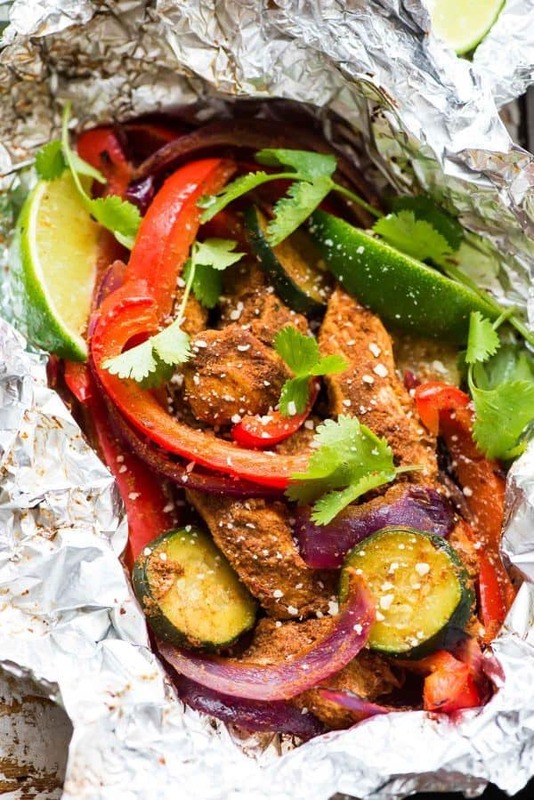 An easy, healthy recipe for perfectly seasoned Grilled Chicken Fajitas in Foil Packets. Foolproof and perfect for fast, healthy dinners and summer cookouts. Preheat the grill to medium/medium high (about 450 degrees F). Place the chicken, bell peppers, onion, and zucchini in a large bowl. Top with the lime juice, chili powder, cumin, garlic powder, salt, onion powder, and cayenne. Toss to coat. Lay 6 large pieces of heavy-duty foil on the counter (if not using heavy duty, use two pieces of regular foil stacked on top of each other for each packet). Generously coat the foil with nonstick spray. Divide the chicken and vegetables among the 6 pieces of foil, then wrap them to form packets: bring up 2 sides of the foil so the edges meet. Seal the edges, making a tight 1/2-inch fold, then fold again, allowing space for heat to circulate. Fold in the ends to seal. Grill for 8 to 12 minutes, until the chicken is no longer pink in the center and the vegetables are crisp-tender. Carefully open the foil and allow steam to escape. Serve warm with tortillas and desired toppings. Store leftovers in an airtight container in the refrigerator for up to 3 days. Rewarm gently in the microwave. Chicken and vegetables can be seasoned and stored in the refrigerator up to 1 day in advance. I haven't tried also assembling the foil packets in advance, but I think you could assemble and refrigerate them for a few hours, then place them on the grill when you are ready to cook. This appears to be about as simple as it gets – idiot proof! I don’t mess with our grill but I certainly can put together packets like these. These items will be on my grocery list today. I like that this is a recipe that can be adapted to individual tastes and amounts of each ingredient. We love grilled onions so that’s one item that I’d double up on. My husband is one of those crazies that grills all year long no matter what the weather and I love that he does. Chris, I hope you enjoy the recipe! You’re absolutely right that these are great for customizing depending on what your veggie preferences are! 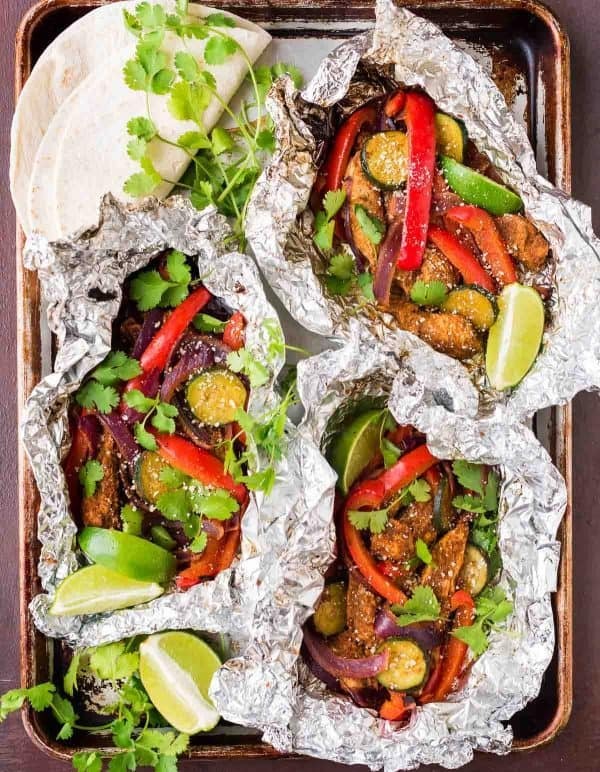 Foil packets is one of the ideas I have for cooking for a crowd up north this summer and I love the fajita idea! I’ll be keeping it in mind as an option. My summer bucket list includes spending more time reading good books and spending more time outside exploring local parks and trails instead of just sitting around at home on the weekends. Besides brats and burgers my husband and I are not the most experienced grillers, but we’re planning on trying steak next! That sounds lovely, Kelsey! I hope you love the fajita packs if you do give them a try! This looks so easy and sounds delicious. Thanks for the inspiration. It is nice to be able to grill outside and not heat up the kitchen in the heat of the summer. Why make the AC work so hard if we do not have to do so. Ha! Could you cook these in the oven? Hi! I haven’t tried these in the oven, but it should work! I would suggest 375 degrees F for 30–35 minutes and then check for doneness. Erin, these look divine! So easy and look so tasty! Thanks for a super fun summer grilling recipe! I no longer have a grill, could these be converted to the oven? Hi MaryAnn, I haven’t tried these in the oven, but that should work! I’d bake at 375 degrees F for 30–35 minutes and then check for doneness. Is there a way to do this in the oven ? Any recommendations? Broil? Temp ? Time? Hi Alice, I haven’t tried these in the oven, but it should work! I would suggest 375 degrees F for 30–35 minutes and then check for doneness. These are so easy and it looks so delicious. I will be trying it for sure! Thanks, Carolyn! Hope you enjoy! I love easy summer dinner recipes like this, and I know my kids would too! These grilled fajitas are now on my bucket list :) They look so easy and delicious! This is definitely our kind of meal – love the flavors + we grill every single day during the awesome non-winter, so we’re always looking for something new and easy and delicious! I was thinking of preparing the packets and then freezing them before actually grilling them: to take with on our camping trip for grilling on the campfire. Do you think these would freeze well before being cooked? Hi Sally! I’ve never tried freezing these, so I can’t speak from experience but I think it could work! The veggies will lose some crispness after being in the freezer. If you don’t mind that, I think it would be worth trying! I love grilling but always feel like I run out of ideas… thanks for throwing another one into the pot (onto the grill…)! We love making grill packs – especially my husband because then he doesn’t have to clean the grill lol! I made this tonite, and it was delicious! I cut down the chili and Cayenne pepper in half since we don’t like it very hot. Still had a bite tho. I had some pre-cooked chicken already thawed so I sliced that up, and only needed it on the grill for 15 mins. Hubby said I can make this again. Val, I’m so glad the recipe was a winner for you! Thanks so much for sharing your adjustments and how it turned out! Wow, those looks so good! I have never ate them to be honest and it seems quite easy to prepare actually! Gonna try them soon! I’m so glad to hear you enjoyed them, Melissa! Thanks so much for trying them out and reporting back! These were great! So tasty and easy to make. Loved the addition of the zucchini for some extra veggies. Erica, I’m so glad to hear you enjoyed them! Thanks so much for giving the recipe a try and reporting back! I’m hosting a big backyard camp out in a few months and my teenage daughter chose your recipe to cook for all her friends on the camp fire…any cooking suggestions for the open-flame? Hi Shannon, I’d make extra sure that the foil packets are sealed tight so there’s no loss to the fire. The packets may take a little longer on the coals depending on how hot the fire is—I’m sure there are some good sites if you do a google search about doing foil packets over a campfire that might have some additional helpful tips! YAY Megan! Thanks for giving the recipe a try and sharing how it went! Hi there, all those foil packets look really good, but i dont want to use aluminum foil. Is there a more reusable option for grilling up these? Doris, I haven’t played around with one to be honest. If you do have any suggestions though baed on other experiences, I’d love to hear your ideas! I knew that as I was mixing all of the ingredients this was going to be good. Took these foil packs on a camping trip and they turned out great! Great flavors! Thanks for the recipe! Hooray! Thanks for reporting back, Ana. I’m glad you enjoyed them!